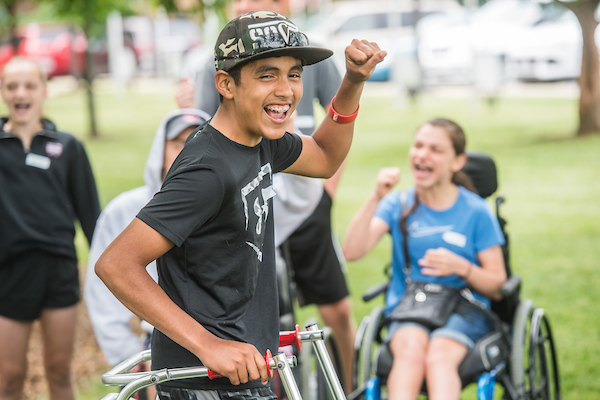 Youth Challenge activities are designed to serve children (ages 4-19) with physical disabilities. Individuals must have a physical disability (i.e. cerebral palsy; spina bifida; muscular dystrophy; orthopedic, visual, or hearing impairment) and are able to participate in age-appropriate activities. To become a member of Youth Challenge, please contact Mackenzie Vecchio, Program Manager, at mvecchio@youthchallengesports.com or call (440) 892-1001. All new participants must meet with the Program Staff and complete the required forms before attending a Youth Challenge program. Transportation is available on a limited basis. Each program is conducted by the YC Program Staff. In addition, we often have other professionals assist with particular activities in their area of expertise (i.e. music therapists). Youth, ages 12 and up, are paired up one-on-one with a child, and are trained seasonally. Training includes how to properly assist a child with a physical disability, disability awareness, program etiquette, and safety. For more information on being a volunteer at Youth Challenge, please visit our Volunteers page. Youth Challenge is now offering all of its programs at no charge.